Meat Dicer BQDJ-I - Hangzhou Expro Machinery Engineering Co.,Ltd. 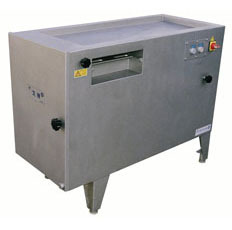 BQDJ-I dicing machine is designed for cutting meat lumps into meat cubes and julienne meat. By using various sized cutting bar knives and adjusting main cutting knife speed, different sized products can be produced.